Established in year 2007, we, Siddhivinayak Glass Concepts, are among the prestigious organizations engaged in manufacturing, supplying and exporting Empty Glass Bottles & Jars. In which includes Empty Liquor Bottles, Coloured Glass Bottles and Cosmetic Glass Bottles. We have been satisfactorily serving a number of Industries such as Pharmaceuticals, Liquor, Cosmetic, Perfumery & Food & Beverages, etc. Being a customer oriented organization all our efforts are directed towards achieving highest satisfaction level of the customers. We strongly believe in providing optimum client satisfaction. These professionals are highly skilled and are aware of the trends prevailing in the market. The complete range of our glass products is widely demanded for its optimum quality. At any case we never compromise in the quality part of our products and follow stringent quality control mechanism at our in-house production unit. These steps help us to make sure that our products have high durability and fine finishing. Under the qualitative guidance of our CEO, 'Mr. Abhimanyu Prakash', we have been able to provide a qualitative range of products to our respectable clients. His continuous motivation has helped us in establishing our business and becoming one among the leading organizations. We exports our products in Africa, Iraq, USA, Malaysia. 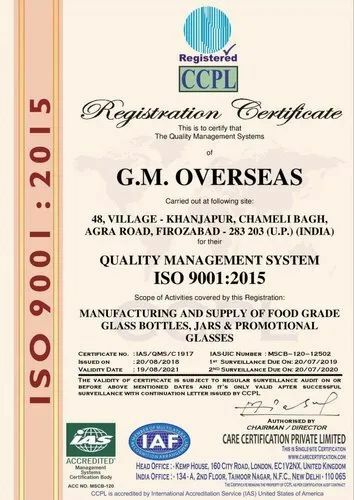 G.M Overseas an ISO 9001:2015 Certified Company has an ongoing commitment to Quality assurance and takes Pride in maintaining the Highest standard of workmanship and services. In our Organization Quality has always been our main concern. We always put all our efforts and hard work to maintain optimum quality of the Products. We procure our range of products only from authorized and established vendors which are present in the market. We also trust in making our tie-ups only with such associates or suppliers who follow strict quality norms in their overall process of business enhance our flawless range of glass products, we also request our vendors to thoroughly cross verify every products before making the final delivery. We at G.M Overseas have a skilled and experienced team of experts that helps us in understanding the demands and requirements of our clients in a proper manner. Moreover, the experts are selected on the basis of their skills and experience in their specific fields of expertise. They work in close coordination with each other to increase customer’s expectations in terms of product quality long term and durability. Further, the team is provided with necessary training at definite time period to work in an efficient way. At G.M Overseas, we have a clear vision of what we would like to accomplish and we constantly strive to meet this challenge. We have been able to carve a niche for ourselves in the industry and thus forming a huge clientele base across the globe. Further, we have become one the largest suppliers of glass containers not only in India but in Asia as well. In addition to it, we have been successful in venturing ourselves into the export markets and look forward to create a name for our company with the kind support of our customers. Our organization is bestowed with numerous outstanding attributes. These traits together resulted to strengthen our company and give an upper edge over the competitors.